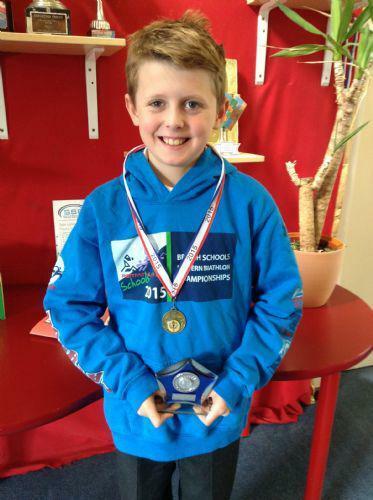 Woodlea Junior School’s Tom Arkwright placed 6 Nationally in ‘British School’s Biathlon Championships’. In October 2014, Tom Arkwright, a pupil at Woodlea Junior School, competed in the British Modern Biathlon Championships for the North West Region. He represented Leyland Barracudas at this event. This was held at Salt Ayre in Lancaster and consisted of 2 disciplines; an 800m run and a 50m swim. This was Toms first biathlon, as he has normally only competes in the swimming pool. To his amazement, he not only won the swim discipline for his age group, but won the whole competition, making Tom the ‘North West Biathlon Champion 2014 – 2015’. Winning this competition meant that he qualified for the ‘British Modern Biathlon Championships’ held in Birmingham. Success continued for Tom and he yet again won the swim discipline for his age group and was in 13th placed overall in Great Britain. Following this event, Tom was ranked 9th nationally for his age group. Due to Tom’s success in that competition, he was automatically entered in the British Modern School’s Biathlon. These championships were held in March this year and took place at the Olympic Park in London. At this competition, Tom represented his own school, Woodlea Junior School in Leyland. Tom completed his run and then swam his freestyle race in the Olympic pool. Tom was delighted after completing the race when he looked up at the scoreboard and saw his name in bright lights as the winner on the score board. There was over 100 boys competing in his age group. Overall he won the swim discipline and was placed 6th in the actual championships, which earned him a trophy and a medal, and was presented these by a member of ‘Team GB athletes’. Tom mainly focusses on swimming at his local club, Leyland Barracudas, who introduced him to the Biathlon initially. He has already won many gold medals and this year competed at county level. His parents, club and school are extremely proud of Tom and of what he has achieved at all levels in his varying competitions and wish him further luck in his future sporting career.